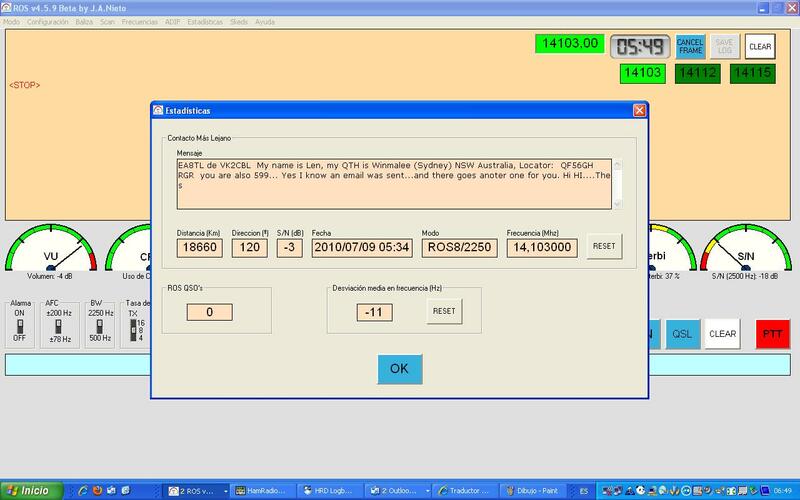 Francesco Picconne YV4GJN sent this screenshot of his first QSO with Australia in ROS with VK2CBL at 1:00 UTC. 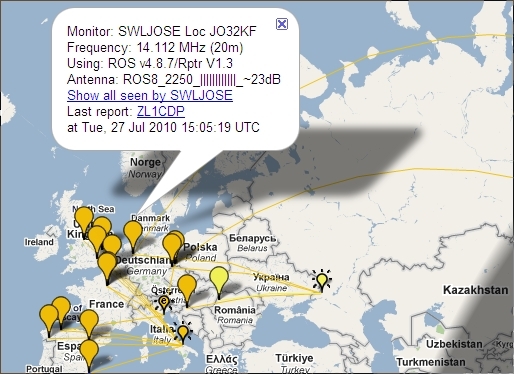 He was using ROS4 and 70W to a Carolina Windom short Antenna and he could be decoded at Twente SDR too. Congratulations! 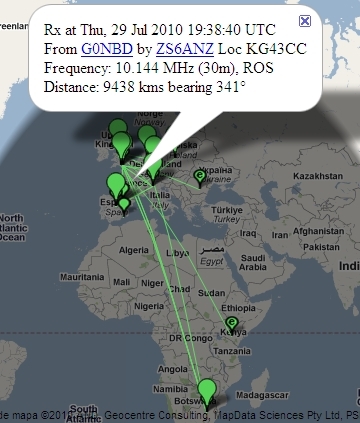 New African Record on 30 meters, this time a QSO of G0NBD with ZS6ANZ of 9438 kms using 20 watts and 35 feet of scaffold pipe (home made vertical) . QSO started with 8 bauds (Marge 5 dB) and they finished using 4 bauds for more guaranties. Congratulations and thanks for the report. 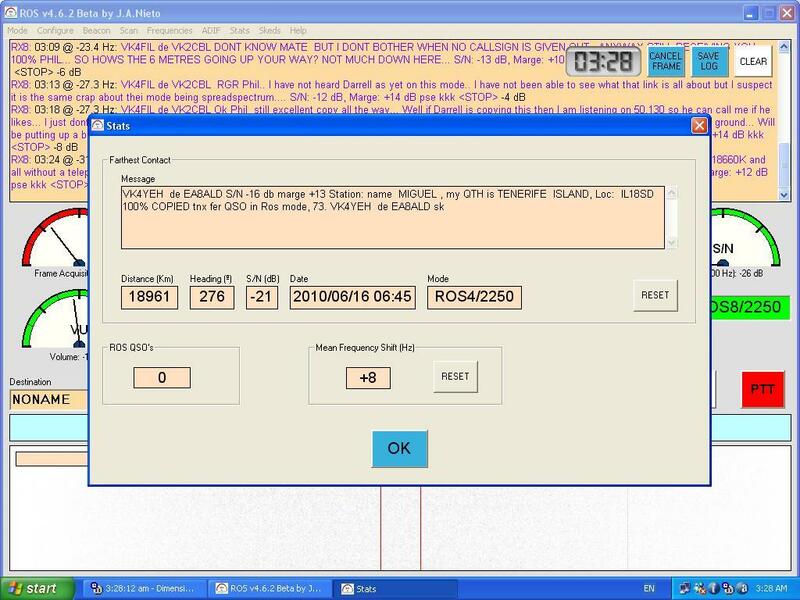 Great QSO on 30 meters across Africa (8500 kms). Congratulations to ZS6ANZ, UT3WW and UT2GA. Perfect copy with a S/N of -23 dB, Fade Marge only 3dB using ROS8/2250. In this case using ROS16 the contact had been impossible (Marge 0 dB) so, for long distances and low power, the best options are ROS8 or ROS4. Note: The record is in distance, not in Power. Nice QSO reported by Graham G0NBD on 20 meters, 25w Antenna 35 ft vert. 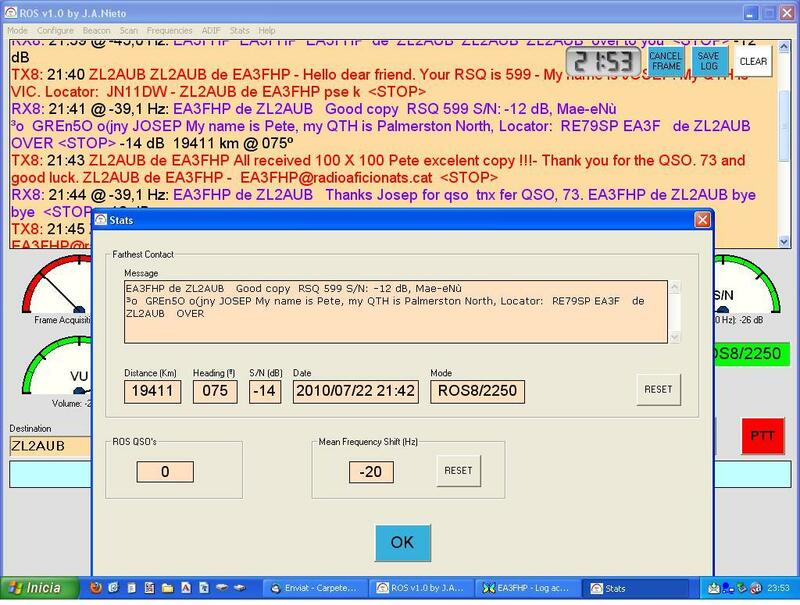 He was transmitting with 8 bauds, and PY6HL was using 16 bauds. 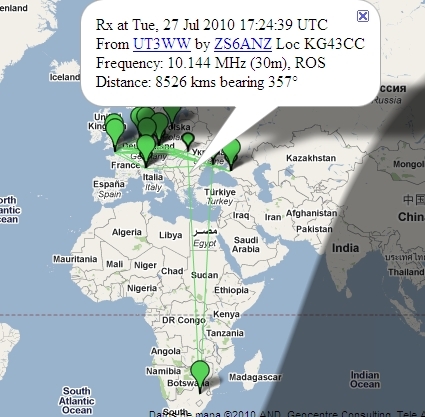 As usual in ROS, 18961 km with 100% copy. 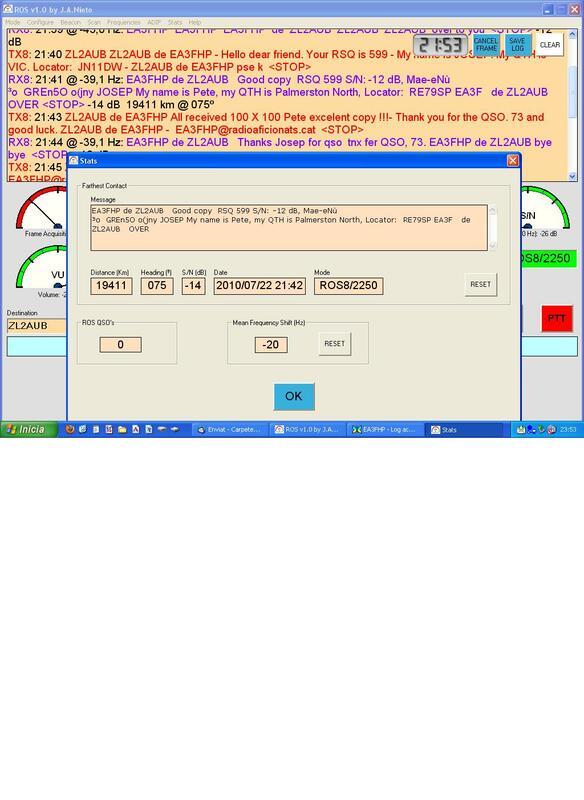 New record in the EA8TL stats on 20 meters. This time with Len VK2CBL at Sidney at 18660 km from his QTH. 599 in both sides. S/N: -3 dB . It means 23 dB of Fade Marge with ROS8. VK2CBL could have reduced 40 times his power to achieve the same result: 100% error free. 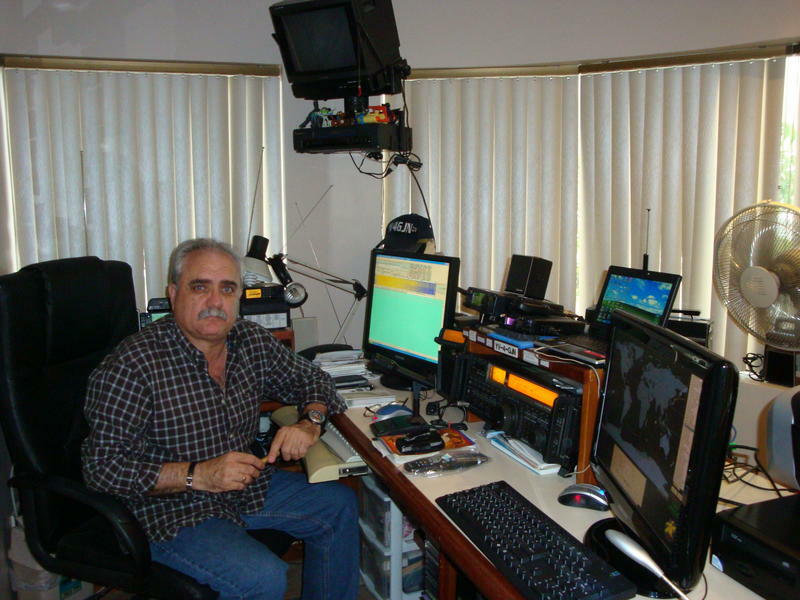 Congratulations to Len and Jorge for this Great QSO, but try decrease the power when you use ROS. This is not PSK31.